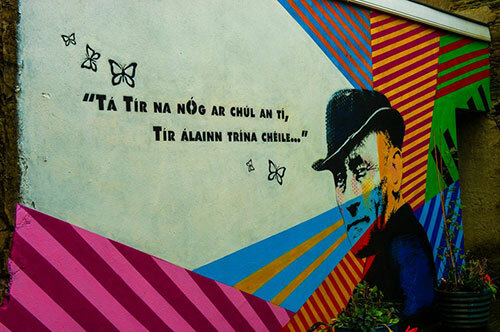 Teacht le chéile gach seacthtain i 49 An Sráid Thuaidh (49 North Street) chun cúpla focail as Gaeilge a labhairt. Tá an t-atmaisféar ana-chairdiúil agus tá fáilte roimh daoine nua gach aon oíche. Bígí linn! Fite Fuaite is a ‘Pop Up Gaeltacht’ Irish language circle that aims to provide an enjoyable space where all levels of Irish can be spoken in an informal and relaxed environment. The group is led by native Irish speaker Deirdre Ní Luasaigh, who says “conversation, Twitter & maybe even a little craic more than grammar and the modh coinniolach will feature at Fite Fuaite”. Beidh tae agus caife le fáil. Absolute beginners are absolutely welcome! Fite Fuaite meets in 49 North Street on Tuesday’s from 11am to 12pm. All are welcome!